The applicator is at the heart of every labeling operation. 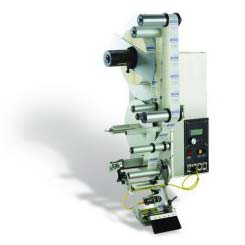 The SL2000 is a wipe-on label applicator with speeds up to 3000 inches per minute. The stepper driven machine is a low-cost, low maintenance unit, featuring digital controls and digital label sensing, built into a durable labeling workhorse. The SL2000 is available in: Wipe-on, Tamp, Tamp-Blow, and Blow-on. Web width: Up to 6.375"